We used Carrot seed oil to help remove excess water and to prevent cellulite in the Cellumend formula. 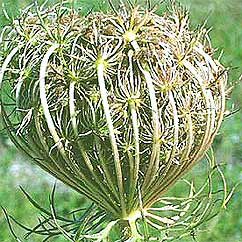 It is extracted from Daucus carota from the Apiaceae family and is also known as wild carrot and Queen Anne's lace and is used in the Cellumend formula to help remove excess water and to prevent cellulite. Carrot seed oil has a slightly sweet, dry aroma and is mainly obtained from wild carrots, usually found in Europe. It is an annual or biennial herb with hairy leaves and umbels of white lacy flowers with purple centers. The therapeutic properties of carrot seed oil include: antiseptic, carminative, diuretic, emmenagogue, tonic and vermifuge and tones the skin while it also boosts the liver and the digestive system. Daucus carota sativa (Carrot) seed oil is the oil obtained from the seed of the carrot, Daucus carota sativa. In cosmetic manufacture it is classified as a fragrance ingredient as well as a skin conditioning agent (emollient) and chemically classed as a fat and oil.